In a previous post we looked at the new label file format used by DYMO Label v.8 software (DLS) from a bird’s eye view. Now it’s a time to look a little closer. The most important thing in a label file are label objects. Label objects contain data and formatting properties and define the label’s content. All object types and most of their properties are available through the DLS UI and are pretty straightforward. In this post we will briefly describe all label objects and will look at most important properties as well as at properties not available through the UI. 027                         <Font Family="Arial" Size="12" Bold="False" Italic="False"
071                         <Font Family="Arial" Size="12" Bold="True" Italic="False"
080                         <Font Family="Arial" Size="12" Bold="False" Italic="True"
088                         <Font Family="Arial" Size="12" Bold="False" Italic="False"
097                 <Font Family="Arial" Size="12" Bold="True" Italic="False"
099                 <Font Family="Arial" Size="12" Bold="False" Italic="True"
101                 <Font Family="Arial" Size="12" Bold="False" Italic="False"
117             <Font Family="Arial" Size="12" Bold="False" Italic="False" Underline="False"
140             <TextFont Family="Arial" Size="8" Bold="False" Italic="False"
142             <CheckSumFont Family="Arial" Size="8" Bold="False" Italic="False"
166             <Font Family="Arial" Size="12" Bold="False" Italic="False" Underline="False"
189             <Font Family="Arial" Size="12" Bold="False" Italic="False" Underline="False"
532         <Bounds X="5091.28344726562" Y="1602.90002441406" Width="582.716552734375"
Note: lines ##211-506 contain image data and were deleted because the real image content is irrelevant to our discussion. Name is one of the most important properties. It serves as a unique identifier for an object. Usually it is used to refer to the object from code that uses the DYMO Label SDK. There are no restrictions how to name the object. The name can contain any Unicode character and the name length has no limit. Still, it is a good practice to only use alpha-numeric characters and keep the name length short. It is not required to assign a name to the object – if the object is not going to be referenced it is perfectly OK to have empty name. It is also OK (but not very useful) to have two or more objects with the same name. The DYMO Label Runtime will use the first object found with a specified name. There is no guarantee which object with the same name will be used. Names are case sensitive, so “Name”, “NAME”, and “name” are treated as different names. LinkedObjectName property defines a link where you can content from a different object as content for the current object. For example, look at line #124. It specifies that the text for the barcode object named “Barcode” should be taken from an object named “BarcodeText”. In the DYMO Label application it is only possible to link a barcode object to a text object. But in code it is possible to link any objects by specifying LinkedObjectName property directly in the label file. Line #432 directs the Runtime to get image data for the graphic object named “Graphic-Clone” from the graphic object named “Graphic”. As a result the label file contains only one copy of the image data: that significantly decreases its size. The Text object displays a block of text. The example above specifies that the text contains three lines, with each line formatted differently. The Element tag specifies a range of characters with the same formatting. The String tag specifies text/characters, while the Attributes tag specifies text formatting attributes. The UseFullFontHeight property can be used to increase font size to the maximum possible size when shrink-to-fit or auto-fit are applied to the object. When UseFullFontHeight is True (the default) the line height is calculated based on the font metrics. So, the height is the same regardless of the text content. When UseFullFontHeight is False the line height is calculated based on the height of each character’s “black box” (an area where glyph outline is drawn). Because usually a character’s “black box” height is smaller than its font height a bigger font size can be used to draw text. This property might be useful in scenarios where printable area is limited but you want to make the text as large as possible, e.g. for tape labels. For example, below is the same label with only UseFullFontHeight property changed. The Address object is similar to the Text object. It is used to display address information. 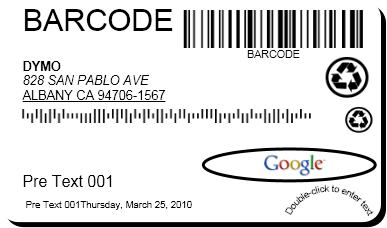 If the address is a valid US address then the Address object can also display and Intelligent Mail barcode. The Barcode object is used to display barcodes on the label. The Image object is used to display bitmap images on the label. The Image property specifies image data. Image data is encoded using base64 encoding and the image data itself is in PNG format. The ImageLocation property is another way to specify image data. In this case image data is not stored inside the label but is loaded on demand from the specified URI. The URI can be a path to a local file, e.g. “C:UsersUserNameDocumentsMyImage.png” or “http://”, “https://” or “file://” URLs. The URI can point not only to PNG files but to any image file type supported by the DYMO Label Software (BMP, JPG, GIF, TIF, PNG). ImageLocation can be used in scenario when there is a set of label files that should share same image, e.g. a company logo. Note: the specified URI will be accessed on demand, basically when a label is being printed or previewed. If the URI specifies a remote resource there can be a delay or even an exception if the URI is inaccessible. The Date and Time object is a special kind of the Text object designed to display current date and/or time. The Counter object is a special kind of the Text object designed to print auto-incremented numbers. Every time the label is printed the Current property of the Counter object is updated based on the Increment property. So, the next time the label is printed the new updated value for the Counter will be used. Note: To preserve the value Current property between an application runs (so, the next time application runs the Counter continues from its last value), the label should be saved when the application exits. To avoid unnecessary label modifications we do not recommend to use Counter objects in SDK applications. Use Text object instead and format its text according to the application’s logic. The “current” counter value can be fetched for example from a database or from a web-server in a way the application fully controls and understands. The Shape object displays simple geometric figures like rectangles and ellipses as well as vertical and horizontal lines. The Circular Text object display text on a curve. Usually it is used on CD/DVD labels.